When initially addressing a problem, I usually start with a spherical cow approximation. Extreme accuracy is not needed in every investigation, and the extra work to achieve exquisite control in an experiment would just waste time. When things look promising, I clean things up later. Of course, I always risk overlooking that Nobel Prize discovery lurking in the next decimal place, but I'm usually not that lucky. I remember my first introduction to significant digits, which was in high school chemistry. There's always a lot of long division in chemistry problems, and division was a lot of work in those days before inexpensive calculators. Knowing when to stop calculating was a big help. In my college days, sliderule calculations were liberating, since your significant digits were physically limited by your computing device. We usually treat the Earth's mass as a uniform sphere; and, thereby, a point source of gravity at its center. However, looking out nearly any window will convince you that Earth's topography is not that uniform. Of course, Earth's surface features, which range from Mount Everest (8,848 meters above sea level) to the Mariana Trench (10,911 meters below sea level), are just 0.31% of the radius of the Earth (6,371 km); so, it might as well be a perfect sphere. I wrote about Newton's conclusion that a uniform spherical mass can be analyzed as a point mass in a previous article (Newton's Gravitational Theorem, March 5, 2012). Aside from these minor surface imperfections, the rest of the Earth is relatively homogeneous, at least when examined radially. As the figure shows, the variation of gravitational acceleration from place to place is of the order of tens of milliGals, compared with the standard surface gravity of 976-983 Gal. The overall variation is just 0.01%. The Gal unit is named in honor of Galileo for his pioneering studies on gravitational acceleration. The mean gravitational acceleration of the Earth is about 980 Gal, so the anomalies are small. 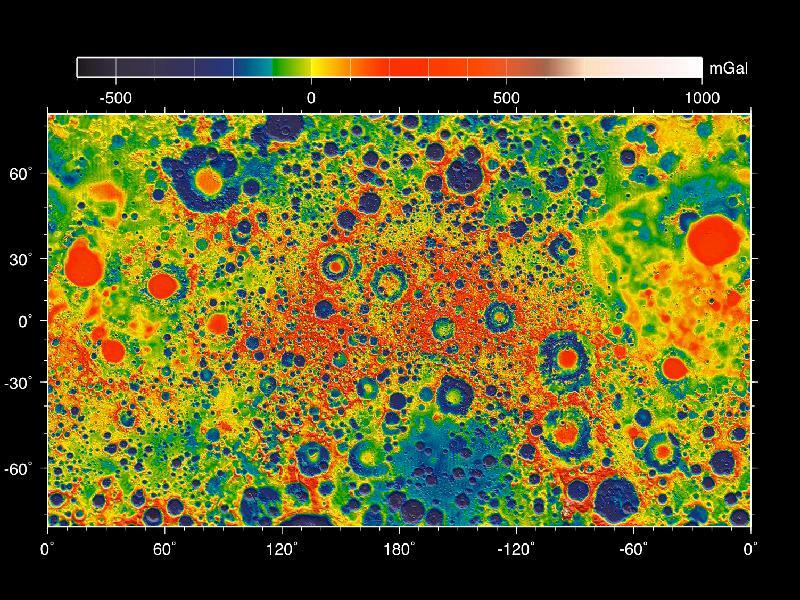 The GRAIL lunar gravity mapping was done by a team with members from five US universities, one French university, NASA's Goddard Space Flight Center, and two research institutes. Maria Zuber, a Professor of Geophysics in the MIT Department of Earth, Atmospheric and Planetary Sciences and MIT's vice president for research, is GRAIL's principal investigator. Jay Melosh, Distinguished Professor in Purdue University's Department of Earth, Atmospheric, and Planetary Sciences, was the lead author of the Science paper. This mapping was done using microwave range data between two spacecraft, GRAIL A and GRAIL B, renamed Ebb and Flow. These craft were placed in a nearly circular orbit passing over the poles of the Moon at low altitude (about 34 miles, or 55 kilometers). As these craft passed over areas of greater and lesser gravity, their separation changed slightly. [4-5] Such range data allowed a determination of the local lunar gravity over the entire lunar sphere, as seen in the figure. As can be seen in the map, the mascons look like target patterns with a gravity excess in the center surrounded by a gravity deficit. In many cases, there's a positive outer annulus. This pattern arises from the the process of mascon creation, which starts with crater excavation, collapse of the impact area, and the isostatic adjustment, cooling and contraction of the melted material. [3-5] The asteroid impact doesn't just eject material. It also sends a shock wave into the Moon's interior that brings up dense lunar mantle material to the surface. "Mascons also have been identified in association with impact basins on Mars and Mercury... Understanding them on the moon tells us how the largest impacts modified early planetary crusts." In 1894, Albert A. Michelson of the eponymous Michelson-Morley experiment attributed the following to William Thomson (Lord Kelvin). "An eminent physicist remarked that the future truths of physical science are to be looked for in the sixth place of decimals." Isaac Newton, "Principia: The Mathematical Principles Of Natural Philosophy," English translation, via Archive.org. The theorem is found as Proposition LXXI, Theorem XXXI. H. J. Melosh, Andrew M. Freed, Brandon C. Johnson, David M. Blair, Jeffrey C. Andrews-Hanna, Gregory A. Neumann, Roger J. Phillips, David E. Smith, Sean C. Solomon, Mark A. Wieczorek and Maria T. Zuber, "The Origin of Lunar Mascon Basins," Science, Published Online May 30, 2013, DOI: 10.1126/science.1235768. NASA's GRAIL Mission Solves Mystery of Moon's Surface Gravity, NASA Press Release, May 30, 2013. Elizabeth Gardner, "Purdue-led team solves one of the moon's mysteries," Purdue University Press Release, May 30, 2013. Jennifer Chu, "An answer to a lunar mystery: Why is the moon's gravity so uneven?" MIT Press Release, May 30, 2013. Michael Lemonick, "Revealed: The Awesome Explanation for the Moon's Extra Gravity," Time, May 30, 2013. Linked Keywords: Spherical cow; approximation; accuracy; experiment; Nobel Prize; decimal place; significant digits; high school; chemistry; long division; inexpensive calculator; calculation; calculatingvcollege; slide rule; sliderule; bamboo; aluminum; aluminium; plastic; Wikimedia Commons; Earth's mass; sphere; point source; gravitation; gravity; center; window; Earth; topography; Mount Everest; Mariana Trench; radius of the Earth; homogeneous; radius; radial; gravitational acceleration; milliGal; standard surface gravity; Galileo Galilei; gravity anomaly; gravitational anomaly; Earth's large liquid core; mass; Moon; asteroid; scientist; NASA; Gravity Recovery and Interior Laboratory; GRAIL mission; Science; Jet Propulsion Laboratory; Apollo 11; mascon; lunar mare; lunar basin; iron; lava; United States; US; university; France; Goddard Space Flight Center; research institute; Maria Zuber; Professor; Geophysics; Massachusetts Institute of Technology; MIT; Department of Earth, Atmospheric and Planetary Sciences; principal investigator; Jay Melosh; Purdue University; Department of Earth, Atmospheric, and Planetary Sciences; microwave; range data; spacecraft; GRAIL A and GRAIL B; circular orbit; pole; altitude; mile; kilometer; Mercator projection; target pattern; annulus; impact crater; isostasy; isostatic; shock wave; density; dense; mantle; computer simulation; computer model; fluid dynamics; hydrocode; finite element method; finite element analysis; Freundlich-Sharonov; Humorum; Mars; Mercury; planet; planetary; crust; William Thomson; Lord Kelvin; Isaac Newton, "Principia: The Mathematical Principles Of Natural Philosophy."